"Most of the Russian artillery used in the Boxer Uprising was not fully QF, being breechloading but carriage-recoil, requiring the gun to be repositioned after each shot. However in 1900 the 3-inch [76mm] M1900 ‘Putilov’ field gun, quick-firing. The gun was designed at the Putilov works in St Petersburg, with involvment from N Zabudskii and A Engelgardt. It had a quick­acting screw breech­block with a locking device, extracting mechanisms and a safety device. The carriage had a pneumatic recoil break and counter-recoil mechanism and a spade. It was this Putilov gun which the Guard Artillery trialled in the field. Range was 6,400 meters, rate of fire 15 rounds per minute, box trail, no shield , with 2 forward facing seats either side of the barrel like the earlier model. Its main drawback was that at 4,145 lbs, it was too heavy for rough terrain." This must be what my grandfather was using during this "trial in the field," as the commendation mentions a "quick-firing" or "fast-firing" battery of the Guards Rifle Brigade. He came to the US after this and worked as a machinist--skills he must have learned after he was drafted into the Imperial Russian Army. From the Russian Artillery Museum, "The creation of the 3‑inch (76‑mm) quick-­firing field cannon Model 1900 became the next step in strengthening Russia’s quick­-firing artillery. . . It had . . a rubber counter-recoil mechanism and a deflection allowing one to fire from indirect laying positions. The essence of this method is shown on the stand Firing from Indirect Laying Positions. Visitors may also see here photos of the fathers of this method, Captain Karl Guk and General-­Major Eduard Forseles, including the cover of a book by K. Guk The Covered Fire of Field Artillery published in 1882. The method of firing was included in the Rules of Firing Artillery of 1891, 1903 and 1904 and then used in the battle training of troops." Does anyone recognize this uniform (see below)? Looking for more information on the Russian Imperial Life Guards Rifle Artillery Battalion's 4 expeditions in Manchuria in 1900, the China Campaign. I'm still looking for ideas about how to trace the battle my grandfather was in on October 25, 1900. Have been reading what I can about where the 2nd Battery of the Guards Rifle Brigade was around that time. So far, no good. If anyone has suggestions, I'd be grateful. Is that cap-badge with crossed rifles significant? 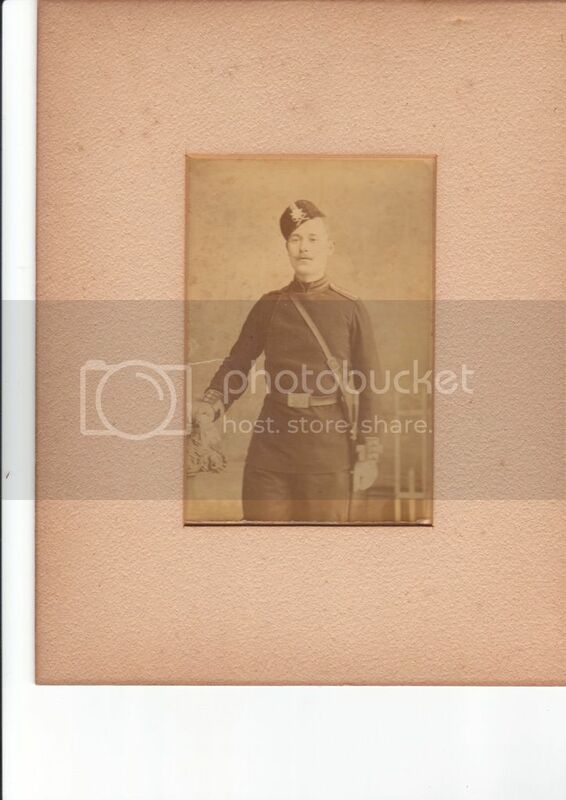 I recently received a picture of my great-uncle in which he is in uniform. His cap and collar have a similar pin or badge with crossed rifles. I assume the rifles are for the Guards Rifle Division. Is that the case? Correction: Guards Rifle Artillery Division.